It’s all over the media – the dreaded short sale. You hear how it takes forever and the frustration of jumping through hoops. But I’m here to tell you today that they can close – and they can close ahead of schedule! Since about March I had toured homes and searched for properties in the Torino and St James area of Port St Lucie with my young first-time-home-buyer Geri and her fiance Justin. The frustration came when we had made a few offers on different properties and got out-bid by other buyers. After a few months of searching and making offers, a property that we had originally toured and liked came back on the market. The sad story was that the listing agent of this property had gone through FIVE other buyers and all of their deals had fallen apart. We were buyer number six and the agent was a little leary that our closing would come to fruition. The good news was that because there were other offers that had fallen apart, we were able to get the seller’s bank’s approval (the part that you will usually wait forever for) within ONE day! The closing went through without a hitch. Our inspection passed, the appraisal passed, and we closed 3 days ahead of schedule (within our 30 day time frame). Geri and her fiance Justin will be getting married in November of 2009 and are excited to make this new home their own. They’re moving from a smaller condo in St Lucie West into this 4 bedroom house and are a little baffled by the amount of space and what furniture they will have to buy to fit into it! 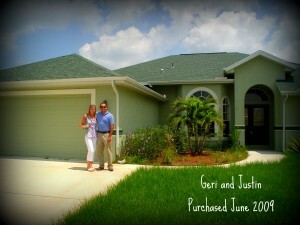 I’m excited that they got a great buy in Port St Lucie and am happy that I was able to help them with their purchase. Cheers to Geri and Justin!